Hey, a while back I purchased a very sad M94 in .30-30 WCF from my local pawnshop. It wouldn't feed into the magazine, so they let it go pretty cheap. It also had some extensive damage at the shoulder-end of the stock. After a disassembly and cleaning I discovered that the feed-cover screw had come loose, allowing the feed cover to come way out of position. 30 seconds and a screwdriver later all was good, except for how it looked. It's original finish was completely gone in most places, and there was extensive pitting corrosion along the barrel. With the condition of the metal and wood it was clear to me that I had a grizzled veteran that deserved some TLC. 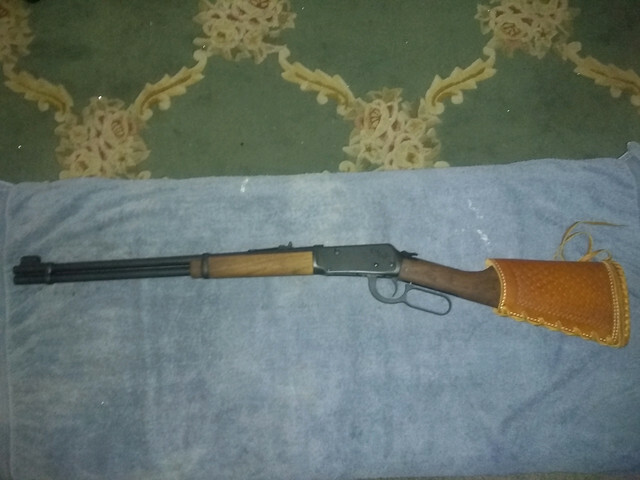 Anyways, I had a local old-school gunsmith refinish it, and I refinished the stock. All I could find for some replacement hardwood didn't match in any way, but I cut 1" off the stock, then glued 1" back on and filed/sanded until the lines matched. Then I used teak oil for a few weeks. It became obvious that the new wood would never match, so I started looking on EBay and found a guy who makes stock wraps for Marlins. I messaged him, and he agreed to make one up for this old veteran. I included some photos and welcome all comments! Nice job, I like the wrap. Have you had it to the range yet? I have. It shoots like it's supposed to...loud as a Gunnery Sergeant and kicks like a mule! I took my first deer in the early '70s with my Dad's "Canadian Centennial" rifle(He always carried the matching carbine, telling me I had to learn to field a rifle first. Unfortunately they were stolen from Him while He and Mom lived in Galt, CA in the '80s and never recovered. My Dad lives in northwest Washington State now, and next time I visit I plan to take this with me to let him shoot it. Nice old Winchester saved and put to work. I recently bought out an old friend’s inventory and with it came a 1918 94 rifle in 32 Winchester Special. I have two 32WS carbines and two 30-30 carbines as well. Good story and nice pics! Thanks for sharing. Crusty old retired RCMP, tractor salvage owner, farmer. I'd like to find one in .32WS someday. looking good, nice job on the stock and wrap. Thanks. The finish is "Cerakote", and the gunsmith followed the required prep to the letter. Even though the pitting is still visible the finish is beautiful. I got the silver-cased Winchester 150-grain "Ballistic Silvertip" ammunition from the local pawn/gunshop. I like how they look in the wrap. The only way to avoid SKS #2, is avoid SKS #1! Is it a pre '64 or post '64? I know the post '64s had some serious issues with the finish or application of it, seen a few real rough ones. 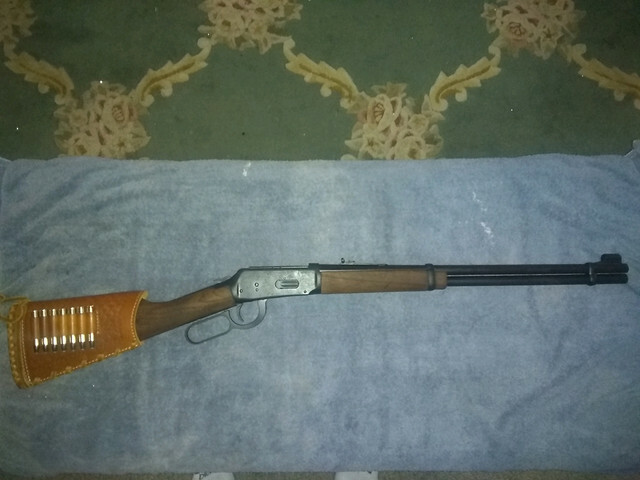 Winchester is one lever action I have never tried or messed with, I have a few Henrys and Marlins, all in various calibers .45-70, .30-30, 44mag, 357mag. Been tempted to try one in 35 Remington.. or a 375 Win. I do love the .45-70 Govt, fantastic flexibility from an old round, one of the few things our Govt ever got right.... it will do everything from downloaded soft shooting black power loads to flat out shoulder stomping loads for a rabid rhino that is charging through your front door. Leave the gun – take the cannoli. I'm pretty sure it's a 1940s build. As for rabid rhinos, I have a Winchester 70 in .375 H&H Magnum for them.